The Americas plates region possesses a wide variety tectonic features; some being one-of-a-kind structures, others occurring at multiple locations globally. This analysis will cover two features in particular detail; one feature unique to this plates region, the other seen worldwide. The first section will compare and contrast two examples of flat-slab subduction in the Americas region, and the second section will cover competing theories of the genesis of the Yellowstone continental hotspot. A tectonic feature found worldwide is the process of flat-slab subduction. This process involves the subduction of a plate at a low angle, creating some interesting properties. Flat-slab subduction is known to be part of the process that created the Rocky Mountains (Laramide Orogeny) (Pérez-Campos et al. 2008). Two regions in the Americas displaying this phenomena include the subduction of the Cocos Plate underneath the Middle America Subduction Zone, and the subduction of the Yakutat plate under the North American plate, which takes place on the southern coast of Alaska. The Yakutat plate consists of thick, buoyant crust which is characteristic of the subducted plate in this type of low angle convergence. The initiation of this feature is thought to be late Miocene, making it a relatively young event (Finzel et al. 2011). The surficial characteristics above the shallow angle subduction zone are similar to other flat-slab cases, which include upper plate shortening, inversion of sedimentary basins, and the occurrence of high magnitude earthquakes. A unique feature of this region’s flat slab subduction include strike-slip related volcanism. Fig. 1 shows that the entire subduction zone of the southern Alaskan margin doesn't consist solely of ﬂat-slab subduction; a good portion consists of normal subduction (Finzel et al. 2011). Fig. 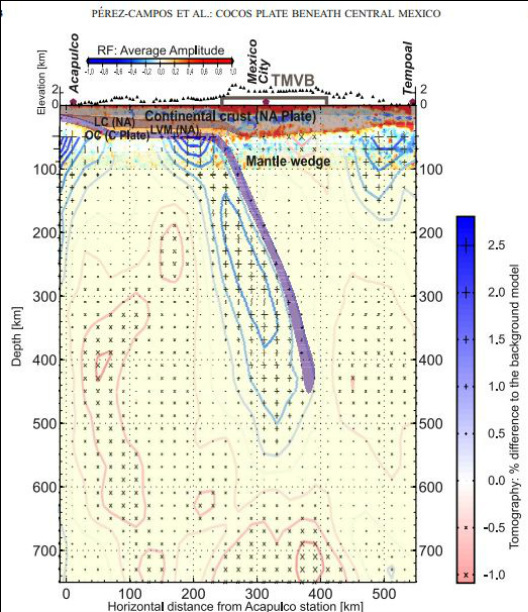 1: The solid red line on the northwest margin of the Yakutat microplate represents the zone of flat slab subduction (Pierce and Morgan 2011). Unlike the Yakutat flat-slab subduction, the Cocos Plate flat-slab subduction does not cause large magnitude earthquakes (due to low coupling). Another difference is that the Cocos plate has normal plate thickness (no elevated buoyancy), which is often to be thought one of the causes of this brand of subduction. Therefore there is no definite explanation for the origin of flat slab subduction in this region. Some special observations of this Cocos subduction include slab rollback, which is a phenomenon that can cause extension via back-arc spreading in the overriding plate (Pérez-Campos et al. 2008). A fascinating feature of the Americas plates region is the Yellowstone hotspot, which is truly an intriguing phenomenon. It is the only continental hotspot currently on Earth, and its origin is widely contested. Two popular theories regarding this feature’s formation include the newer slab fragmentation theory (James et al. 2011), and the classic mantle plume theory (Pierce and Morgan 2009). The slab fragmentation theory consists of a subducted sub-horizontal oceanic plate that is beneath western North America causing volcanism by slab fragmentation and mantle upwelling. This fragmenting plate is found in the mantle transition zone (400-600km, fig.3). The sub-horizontal slab is sourced from the subduction of the Farallon oceanic plate and it blocks the vertical ascent of magma from the deeper mantle which forces it to flow around the margins of the slab (James et al. 2011). There is no definite reason why there are not similar subduction-related continental hotspots anywhere else. However, it is speculated that this special feature is caused by the complex subduction history of the region. This includes flat slab subduction in the Laramide Orogeny, the creation of the Basin and Range, among other events leading up to the subduction of the Farallon plate. What adds uniqueness to this feature is that this hotspot trace has magmatic and heat flow anomalies found nowhere else on the continents (James et al. 2011). Fig. 3: Velocity profile of the area underneath the Yellowstone Hotspot (SRP/Y) showing the projected shape of the sub-horizontal slab (James et al. 2011). The older, classic theory is that of the source of the continental hotspot is due to a deep mantle plume (fig. 4). This theory consists of an inclined mantle plume that is the source of the Yellowstone hotspot track. This hotspot is thought to have originated around 17 Ma. This mantle plume is not perfectly understood, as specifications such as the size of the plume head and its depth of origin are unknown (Pierce and Morgan 2009). Fig. 4: 3D model of the mantle plume causing the Yellowstone hotspot (Pierce and Morgan 2009). Andrea, Stein. eHow, "What Is Slab Rollback?." Accessed January 29, 2014. http://www.ehow.com/facts_7639650_slab-rollback.html. Finzel, Emily S., Jeffrey M. Trop, Kenneth D. Ridgway, and Eva Enkelmann. 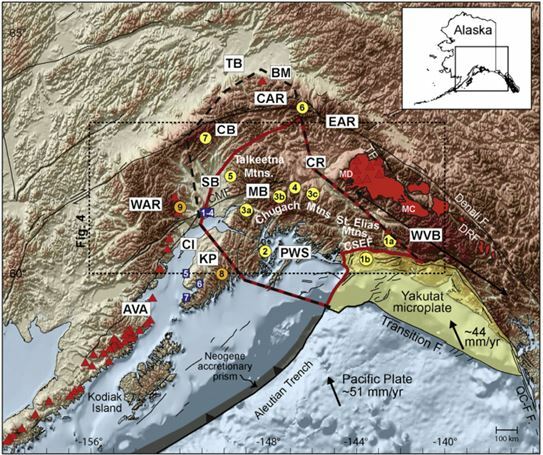 "Upper plate proxies for ﬂat-slab subduction processes in southern Alaska." Earth and Planetary Science Letters. no. 3-4 (2011): 348-360. James, David E., Matthew J. Fouch, Richard W. Carlson, and Jeffrey B. Roth. "Slab fragmentation, edge flow and the origin of the Yellowstone hotspot track. "Earth and Planetary Science Letters. no. 1-2 (2011): 124-135. Pierce, Kenneth L., and Lisa A. Morgan. "Is the track of the Yellowstone hotspot driven by a deep mantle plume? — Review of volcanism, faulting, and uplift in light of new data." Jornal of Volcanology and Geothermal Research. no. 1-3 (2009): 1-25.